Shortly after the attacks of 9/11/01, one of our Truckee Meadows Water Authority (TMWA) employees suggested painting a patriotic mural on one of our water tanks as a way to remember the events of that day and honor those lost. The Reno Highlands Tank, located in Northwest Reno near the intersection of McCarran and Keystone, was chosen as it is highly visible. 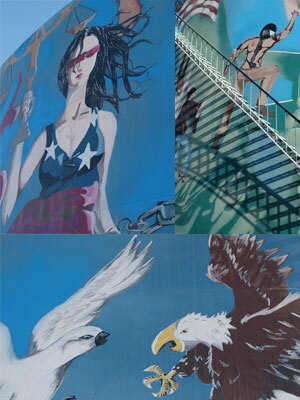 TMWA commissioned local artist Ray Valdez to paint the mural on the tank, as it was the perfect canvas for him to express the emotions of loss, pride and patriotism that every American experienced in the days, months and years after the attacks. For the tenth anniversary, it was time to restore and touch up the mural. The restoration of the tank was recently completed, and this is our official unveiling.